My little girl was a great eater, we did Baby Led Weaning and she would eat anything…until about 12 months. Somewhere around there she started getting picky. Meat especially became a total no go. Didn’t matter what type of meat it was, she was not going to eat it. From being in multiple mom groups I’ve learned that this is a common occurrence. But it still doesn’t make mealtime any easier! Or make me worry less about whether she’s getting proper nutrition. So I did some tried a few things, did some research, and consulted with my doctor about protein and iron rich foods for toddlers. Now I’m sharing those tips with you! Just repeat after me…it’s just a phase…and read on for tips on getting through it! Meat is clearly not an essential component of your diet as there are plenty of vegetarians in the world. However, there are certain nutrients that if you aren’t getting from meat you need to be getting from somewhere. The two main nutrients are protein and iron. I consulted my pediatrician and they suggested the following. My secret weapon: Edamame. It has a good amount of both protein and iron! Your kid won’t touch a veggie with a ten-foot pole? Well, that’s a whole nother issue that I’ll cover in an upcoming post. 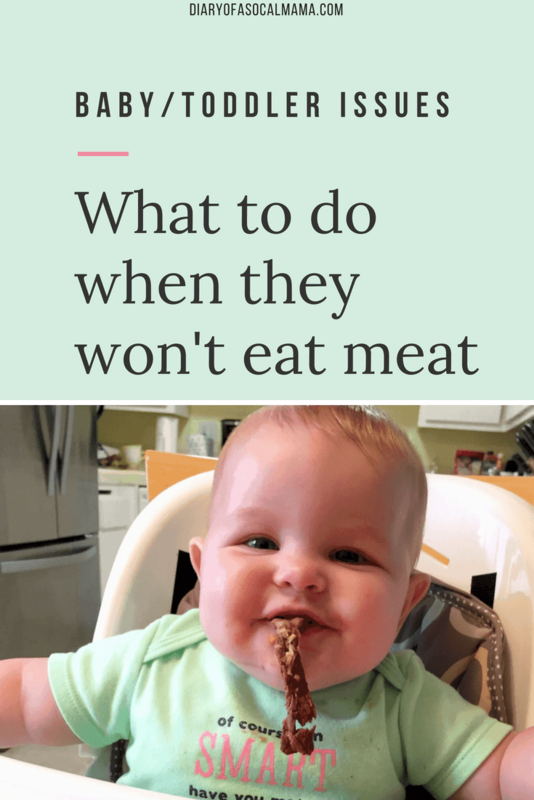 I have three things that have worked for us in getting my toddler to eat meat. Deli Meat – Deli meat is not an ideal food I want to feed my toddler. I know it can be a bit controversial so if you are absolutely against it don’t do it. My daughter will turn her nose up at pieces fo chicken or turkey…but if it’s deli meat apparently it’s different. (Far be for me to try to tell her differently). You can serve it plain or try to sneak it into some sort of sandwich. I love the deli meat from Sprouts as you can get some that is nitrate free. Nitrates are one of the major reasons people don’t like deli meat, but there is this workaround. Cheese – My daughter loves cheese and will eat just about anything if it’s combined with cheese. Sometimes I can mix meat or veggies into a quesadilla or add it to macaroni and cheese and slip it into her…and sometimes she discovers my treachery and refuses to eat it. But it’s worth a shot! Iron is important to keeping your red blood cells and organs healthy and working correctly. Iron is essential, just don’t overdo it. I’m sure many of us were subjected to iron pills while pregnant and know that too much can lead to constipation. According to kidshealth.org a toddler needs 7mg of iron each day. Be sure their offered iron rich foods such as the ones listed above. Vitamin C helps the body to absorb iron so it’s best to serve iron-rich foods with vitamin c rich foods. Broccoli is a great option as it has a decent amount of both! Go ahead and serve those fruits and veggies together. Cows milk (I’m not sure on the effects of other types of milk) can actually decrease the absorption of iron, it can also fill up your child making them less willing to eat their veggies. Limit milk to 16-24 oz per day and try not to serve it with every meal to allow the body to have a better chance to absorb iron. I hope this information helps you to manage nutrition during a meat strike. Remember, it’s just a phase and this too shall pass. Funny enough as I’m finishing up this post my daughter has actually eaten some pieces of chicken and pork chop the last two days. Fingers crossed that at 17 months the no meat phase is over for now…who knows what phase will come next! If you have tips and tricks or questions please comment below! Nuts, nut butters and quinoa are some of our favorites to get our protein intake from. We’re not vegetarian or vegan but prefer more plant based foods. My daughter loves beans too!